How Much Should You Spend to Treat and Prevent Measles in the Philippines? Earlier this year, measles has taken its toll in our country spreading to near parts of business districts and some provinces. We do know that it’s not simple to have this kind of condition. More so, people can prevent and actually treat measles but it’s not that easy. That further begs the question on how much you should spend to treat and prevent measles in the Philippines. Do not worry because in this article, we will be providing the details you need to know in order for you to be prepared to handle scenarios like this. More so, it is imperative that you are aware of this so that you can weigh just how bad measles really is. Measles or more commonly known as tigdas, has been reported to have spread to various major parts of the country. As per the Department of Health (DOH), the outbreaks that were declared were in several parts of Central Luzon, CALABARZON, Central Visayas, Metro Manila, and Western Visayas. Luckily, no news broke out that other parts were affected and we can’t be more thankful for that. Did you know that within just one (1) month, there were more than 4,300 measles cases reported from the 1st of January to the 9th of February, 2019? Yes, within that time period, thousands of people were affected. If we were to compute that, it’s around 107.5 people in a day. Can you imagine how threatening it is? We can’t say we’re lucky because in that amount reported, a total of seventy (70) people passed because of this highly contagious and dangerous disease. What’s alarming is that as per the data of the DOH, 79 percent of the affected did not have any type of vaccination to prevent measles. So, in knowing all of these we should also be aware how much we are expecting to spend if we were to prevent and treat measles. Before we get to the specifics on getting, preventing, and treating measles, we must first need to understand where this specific disease is coming from and the common symptoms it shades to patients. To give you a brief description on what it is, measles is an infectious and a viral illness that is spread typically through the air (talking, coughing, sneezing). It’s not airborne for example, when you share the area with a distance of around 50 ft.; it’s more dangerous if you interact with a person who is infected because direct contact is also a way of passing this condition. 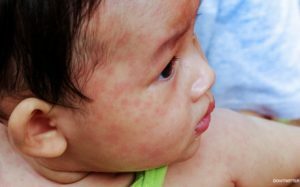 In context, babies and infants are at the most risk of measles because of the fact that they have little-to-no area of protecting themselves. Unlike adults who can avoid or wear masks to prevent it from happening, babies or infants are more fragile and their conditions and statuses should always be prioritized than adults’. The World Health Organization (WHO) has data that shows the number one (1) reason or cause of death of babies. Can you guess what it is? Well, it’s measles. Since they don’t have the immunization and the resistance to the illness, they are probably the easiest targets of the virus. As we grow older, we get more honed to the virus that we naturally concoct something in our bodies to counter it. In adults, however, it’s much less of a risk than in babies or infants. Adults who never received or had any type of vaccine to prevent measles are also at the brink of being affected. Especially women who are pregnant; so, if you have yet to receive this vaccine, be sure to have yourself checked. A pregnant woman who gets infected may suffer from the following occurrences: stillbirth, premature delivery, miscarriage. In addition to that, babies who were conceived by their moms (infected by measles) can also have a lower birth weight than the normal. How much does a measles vaccine cost? Truthfully. prevention is really better than cure. Why? First and foremost, it’s a lot cheaper. Medical experts strongly recommend vaccination as the best type of defense against any type of illness that are deemed deadly. So, if you have a newborn, it’s best to have them vaccinated because as per medical experts, the measles-mumps-rabella (MMR) is most effective when it is given to babies who are nine (9) to twelve (12) months old. These are best given in two (2) separate doses three (3) months apart. Adults, on the other hand, need only one (1) vaccine and they’re good to go. Let’s talk about the cost. Imagine, the cost of being vaccinated will only cost you around P1,3000.00 to P1,500.000. The cheapest, based on the information we’ve gathered is at P1,000.00. But try to think about it; with that amount, you can save yourself from getting this irritating and dangerous disease – don’t you think that it’s worth it? Why should you get the vaccine to counter measles? Contrary to the belief of a handful of people, the Dengvaxia vaccine had its rumors of deteriorating the health of a couple of children. When, in fact, no actual data from the DOH was released as regards this issue. This resulted to the downfall of the immunization rates since 2017; adding up to the measles cases in our country. In the year 2018 alone, more than 17,000 people were able to hike up the disease and as per the DOH’s data, this is eight (8) times higher than the previous year. Imagine the danger and the risks of not getting the measles vaccine; in addition to that, also think of the money you will be spending if you disregard getting the vaccine for yourself or for your children or any family member. Taking from that statement above, with the P1,300.00 cost you have on your plate, what about treating measles? Well, as we mentioned, prevention is always better than cure. So, a healthcare analyst at the Economist Intelligence Unit, Tim Chew, said that an estimation on the cost of each measles case is around $2,000 to $10,000. Can you imagine just the difference in the price if you prevent it vs. if you treat it? In addition to you worrying about the health condition of the patient, spending P104,000.00 to P523,000.00 might be a bit out of the pockets for a majority of Filipinos. Although the estimates of Tim include the quarantine, the productivity loss, and the treatment; and although this estimation might include everything in the bucket, it’s still going to be more expensive than just having that vaccine. How about PhilHealth? Don’t they cover measles? Good news because if you have PhilHealth, they will give you aid if a patient is infected by measles. As per their latest table, they will cover hospital confinement from P7,700.00 up to P25,700.00. If the case is with no complications, however, they are insured with the minimum amount which is P7,700.00. On the other hand, the cases with complications like meningitis are paid and insured at P25,700.00. What if I am not an active PhilHealth member? Can I still get this? Definitely. Even if you have been long contributing to PhilHealth, you can still get this benefit by utilizing Philhealth’s agency’s Point of Service program. As a matter of fact, if a person is financially incapable, they are entitled to a one-year PhilHealth coverage. So, are you scared of getting vaccinated? Or do you fear for your baby to get vaccinated? Well, don’t; because it’s scarier to acquire measles than preventing it. Imagine, getting vaccinated would hurt you in a matter of seconds whereas getting the disease, carrying it, is much more painful to bear and to watch. Measles is not just the measles that we know. As per some medical clinics and healthcare professionals, deadlier diseases have measles as their underlying symptoms. Complications like diarrhea, pneumonia, blindness, malnutrition, and the like can be developed and measles is it’s symptom. Worst case? It can lead to death. In the data reported by the DOH, 70 people passed because of the disease. Currently, the measles outbreak has silenced and we do hope that that’s going to continue on. So, don’t hesitate and wait for it to hit you, prevent it as early as now because remember, prevention is always better than cure.